Looking for a job in Macon County Illinois? 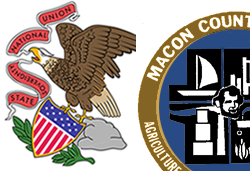 This Macon County Illinois job guide is a resource for job seekers looking for legitimate employment opportunities in the region with an emphasis on government positions, top healthcare employers, public school careers, and major job boards. Macon County Illinois periodically posts job openings. Open positions found on this review date had included System Administrator, Assistant Public Defender, Administrative Assistant, Front Desk Receptionist, Health Educator, Environmental Health Specialist, and Clerical Jobs. Check for current listings. The City of Decatur is the largest municipality in Macon County. Here open positions were found for Civil Engineer and Systems Administrator (Security/Network). Monitor their jobs page for the latest opportunities. The Village of Mt. Zion maintains an employment page. During review there had been a posting for Convention Center Event Staff. The Park District offers a wide range of job opportunities, from seasonal part-time to full-time positions. The Decatur Park District is an Equal Opportunity Employer. Archer Daniels Midland Company ADM is one of the world's largest agricultural processors and food ingredient providers, with more than 32,000 employees serving customers in more than 160 countries. A survey of open positions found had included Class A City Truck Driver, Ag Services Operations Management Trainee, Process Controls Automation Engineer, Shuttle Driver, Research Manager, Emulsifiers Manager, Nutrition Research and Innovation Manager, Mechanic, Web Developer, Electrical Instrumentation Technician, Local Truck Driver, Maintenance Mechanic, Regional Sales Account Manager, and Electrician. The Tate & Lyle business is made up of two units: Speciality Food Ingredients and Bulk Ingredients. Periodically there are open positions available for exciting careers in the Decatur location. Hickory Point Mall consists of over 40 retailers and businesses. During review it was discovered that there is a jobs page. Employing more than 8,500 personnel, Ameren powers the quality of life for 2.4 million electric customers and more than 900,000 natural gas customers across a 64,000-square-mile area. In Decatur there had been open positions available for Real Estate Agent, Lineman Journeyman, and Gas Records Associate. We know that a decision to work for Caterpillar is a commitment of time and talent. In return, we work to provide a rewarding environment and experience for our teammates. At Caterpillar, you build what matters - whether it's the career you want, crucial work skills, strong relationships or new digital technologies. There are big jobs to be done worldwide - building critical infrastructure, bolstering local economies, meeting the demand for energy - and that work is powered by our people. Decatur Memorial Hospital is a licensed and fully accredited 300-bed facility that offers a wide range of general and specialized diagnostic, surgical and treatment services. Administrative Assistant, Cashier, Certified Nurse Aide, Certified Registered Nurse Anesthetist, Certified Surgery Tech, Clinical Informatics Assistant, Communications Operator, CT Scan Technologist, Customer Service Representative, HIM Clerk, Housekeeper, Laboratory Specialist, Licensed Practical Nurse LPN, Marketing Specialist, Medical Assistant, Medical Assistant / LPN, Neurodiagnostics Technician, Nurse Practitioner, Physician Assistant, Office Assistant, Pharmacy Technician, Phlebotomist, Physical Therapist, Processing Technician, Registered Pharmacist (Regular), Registered Polysomnographic Technologist, Registered Respiratory Therapist, Cardiovascular Registered Nurse RN, Critical Care RN, Registered Nurse Surgery RN, Ultrasonographer, Unit Secretary, Utility Worker, and Utilization Review Specialist. HSHS St. Mary's Hospital is a 244-bed, all private room health care facility that combines modern technology with the caring spirit of the original founders. A sampling of jobs found had included Radiologic Technologist, Sonographer Medical, Nuclear Medicine Technologist PRN, Physical Therapist, Environmental Associate, Food & Nutrition Cook, RN Registered Nurse, Respiratory Care Practitioner, Registered Nurse RN Intermediate Care, Speech Language Pathologist PRN, Neurodiagnostic Technologist PRN, Pharmacist, Registered Nurse RN Rehabilitation, Certified Respiratory Therapist, Registered Nurse RN PACU, RN Medical, Environmental Associate, CT Technologist, Certified Nursing Assistant CNA, CNA Nurse Tech, Infection Preventionist, Courier, Neurodiagnostic Technologist, Central Services Technician, Coder, Health Information Services HIM Coder, Licensed Practical Nurse LPN, Maintenance Mechanic, Recreational Therapist, Case Manager, RN Critical Care, RN Cath Lab PRN, Athletic Trainer, Security Officer, Surgical Technologist PRN, Medical Laboratory Scientist, and Phlebotomist. Heritage Behavioral Health Center takes pride in being one of Central Illinois' premier behavioral healthcare employers that attracts a highly qualified and diverse workforce from within a 50 mile radius of Decatur. Open positions found had included Counselor, Administrative Assistant, Residential Specialist, Community Support Specialist, RSA, IPS Therapist, Family Resource Developer, ACT Registered Nurse RN, Recovery Specialist, Licensed Practical Nurse LPN, and Certified Nursing Assistant CNA. Evergreen Senior Living in Decatur, IL, is home to Evergreen Place Supportive Living and The Legacy: Memory Support. Here you may periodically find career opportunities such as Dementia Care Manager, Wellness Coordinator, Culinary Jobs, CNA Certified Nurse Aide Job, LPN Licensed Practical Nurse, RN Registered Nurse Jobs, Business Office Manager, Community Relations Coordinator, Housekeeping Jobs, Laundry Aide, Activity Assistant, Housekeeping Aide, Dietary Aide, and Cook. Imboden is a beautiful home located in the South Shores area that provides geriatric care for Decatur and surrounding towns. Imboden Creek Living Center had advertised the following on this review date: Nursing Positions - ICLC - We currently have RN/LPN positions available; full-time, part-time, weekend, and PRN at Imboden Creek Living Center. Decatur Rehabilitation Health Care Center is dedicated to assisting the elderly population in maintaining the highest possible quality of life for the longest possible time. Omnicare | CVS Health was hiring Pharmacy Technicians, managers, and team members. Heartland Health Care Center hires healthcare professionals and support staff. During review there had been open positions in Decatur for Floor Care, Cook, Certifeid Nursing Assistant CNA, Staff RN, Food Service Jobs, Registered Nurse RN, Licensed Practical Nurse LPN, Occupational Therapist / OT PRN, Physical Therapist / PT PRN, Director of Nursing, and Physical Therapist Assistant / PTA PRN. Eagle Ridge is the first affordable assisted living community to be developed in Macon County. Nursing and support positions are periodically advertised. Decatur Public School District is the 27th largest public school district in the state of Illinois, serving more than 9,000 students. Here you may find open positions such as Information Technology Analyst, Alternative Education Teacher, PE Teacher, Special Education Job Coach, School Nurse, Custodian, Teaching Assistant, 6th Grade Teacher, Physical Education Teacher, 3rd Grade Teacher, English Second Language ESL Teacher, Spanish Teacher, Kindergarten Teacher, School Custodian, Science Teacher, Digital Media Teacher, Cross Categorical Special Education Teacher, Life Skills Special Education Teacher, School Psychologist, Custodial Jobs, School Social Worker, Crossing Guards, and Special Ed Behavioral Teaching Assistant. Heartland Technical Academy maintains employment applications and may periodically post opportunities when vacancies become available. Maroa Forsyth Community Unit School District 2 had open positions on this review date. Positions found had included MS Science Teacher, HS Math Teacher, various coaching jobs, School Nurse, Pre-K Classroom Aide, and Bus Drivers & Substitute Bus Drivers. Meridian Community Unit School District 15 was hiring for Social Studies Teacher / English Teacher, Basketball Coach, Bus Driver, and Elementary Teacher. Check for updates. Mount Zion Community Unit School District 3 had vacancy announcements such as Junior High Language Arts Teaching Jobs, Intermediate Lunchroom Supervisor, Varius Teacher Openings (Kindergarten Teaching Jobs, 1st Grade Teacher, Computer Teacher, Social Studies Teacher), Spanish Teacher Part-Time, Junior High Girls Head Volleyball Coach, Substitute Teachers, BASAP Worker/BASAP Sub, Special Education Aide, Full Time Custodian, Part Time Custodian, Food Service Sub, and Part Time Bus Drivers. Sangamon Valley Community Unit School District 9 periodically posts employment opportunities. Millikin is an independent, four year university that is privately funded and has an enrollment of approximately 2,200 students in traditional and non-traditional undergraduate and graduate degree programs. Here you will find faculty and support staff employment opportunities. Richland Community College, located in Decatur, Illinois, is a comprehensive college with a tradition of educational excellence, offering baccalaureate, associate, technical, and continuing education programs that serve over 11,000 students per year in eight central Illinois counties. Faculty and staff opportunities are often available. Herald & Review Decatur Classifieds Jobs had a good selection of job postings. A survey of open positions incuded Engineer, Loan Officer, Police Officer, Delivery Jobs, Systems Analyst, Janitor, Housekeeping Jobs, Front Desk Receptionist, Administrative Assistant, Truck Driver, Cleaning Jobs, and Nursing Jobs. Monitor the State of Illinois web-based electronic hiring system for job openings in Macon County. This Worklooker directory includes Springfield area top employers. Featured listings include Abraham Lincoln Capital Airport, Memorial Medical Center, Saint Johns Hospital, Sangamon County Regional Office of Education, Ball - Chatham C.U.S.D. #5, Springfield Public School District 186, University of Illinois at Springfield, Lincoln Land Community College, and Sangamon County Sheriff's Office.